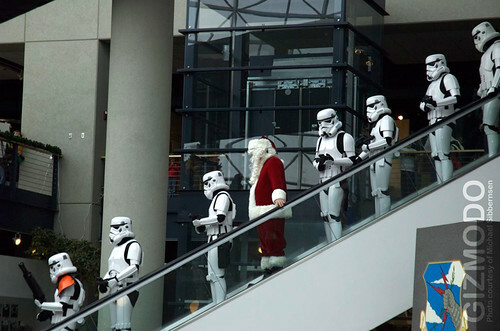 SANTA’S FACTORY, North Pole (Agencies) – An Imperial Stormtrooper commando broke into Santa’s Factory in the North Pole yesterday evening, killing an undetermined number of elves, arresting the owner and confiscating his sled. Joe Kwazansky, local spokesman for the Evil Galactic Empire in Los Angeles, appeared in a press conference this morning confirming the rumors of an Imperial takeover of Christmas’ celebrations. “The Emperor wants to assure His subjects that Xmas will continue as planned. The pug-nosed fatso, however, will pay for his crimes,” Mr. Kwazansky said amidst the palpable shock in the press corps. Apparently, the arrest has occurred in connection with earlier reports on the manufacturing and stealth placement of Weapons of Mass Destruction. Stormtroopers from the Terror Australis 501st Garrison posed outside the Sydney Opera House with two violinists ahead of concerts featuring the work of Star Wars music composer John Williams. Science fiction met classical tradition as violinists Alex Mitchell and Emma West proved they have more than one string to their bow when they braved hordes of tourists. Every year the 501st Legion’s New England Garrison marches in the Woburn, MA Halloween parade. Last year their float featured Luke Skywalker and Darth Vader re-enacting The Empire Strikes Back “I am your father” duel. This year it’s Jabba’s palace, featuring a full sized Jabba the Hutt puppet! Throughout the last 30 years Dolby and Star Wars have formed a strong symbiotic bond in providing the ultimate entertainment experience. So it was no surprise when Dolby teamed up with the 501st Legion’s Japanese Garrison to attract conference attendees to its booth at CEATEC Japan — one of the largest Consumer Electronics shows in the Asia Pacific region which took place from October 2-6. Darth Vader, accompanied by the Emperor’s Royal Guard and stormtroopers, was on hand to patrol the Dolby booth and attract conference attendees to Dolby demonstrations at the show. The Force was strong with Dolby and the 501st Legion as thousands of attendees witnessed Dolby unveil its latest entertainment technologies. These included Dolby 3D Digital Cinema for movie theaters, Dolby Vision and Dolby Contrast to improve LCD TVs with LED backlighting as well as Dolby Volume. 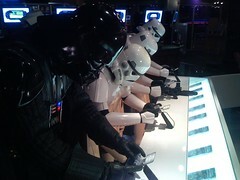 In honor of the launch of Star Wars Battlefront: Renegade Squadron and the Sony Star Wars Battlefront PSP Entertainment Pack, Sony and LucasArts threw a launch party at the Sony Metreon in San Francisco. 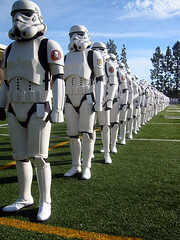 Page 174 of the newly-published book features a write-up and photos of the stormtroopers from the 2007 Rose Parade. Click here for a photo of the page. Congratulations to everyone in the 501st Legion! To read more about the 501st, check out our Know a Legion series on starwars.com. 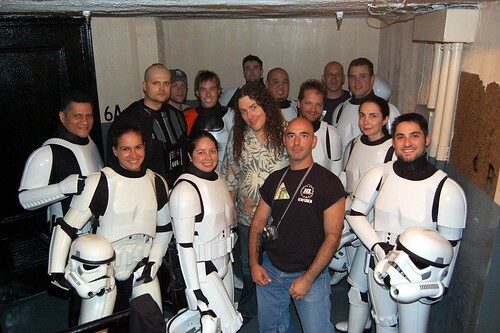 A recent concert review in New York Magazine reveals that our favorite comedian/singer/curly-haired god — Weird Al — invited the Empire City Garrison of the 501st Legion which included a Darth Vader, two sandtroopers and 10 stormtroopers to come up on stage with him — impressing fans including this music critic! The evening’s undeniable highlight was the half-hour mash-up of Al’s best-loved song parodies — yep, he played “Eat It.” “Amish Paradise” too — culminating in “The Saga Continues,” his Star Wars–themed version of Don McLean’s “American Pie,” for which he was flanked by Darth Vader and eight dancing Stormtroopers. Even some girls enjoyed it! You are currently browsing the archives for the The 501st Legion category.